Internationally known as “Countryside air to go” Stall Duft was conceived by Daniela Dorrer, originally from the Bavarian village of Adlkofen, who says her product is meant to help people who were born and raised in the countryside but later moved to an urban area, get over their homesickness. All they have to do is take off the lid, stick their nose in the can and they are instantly reminded of the carefree days they spent in the German countryside, surrounded by farting cattle. 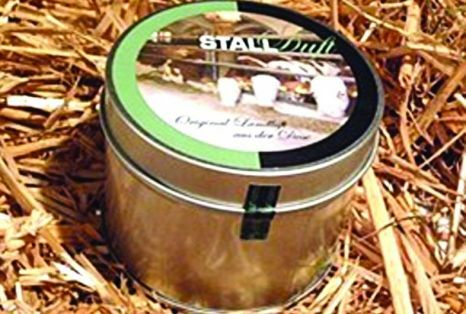 Stall Duft contains textile odorants that retain that country smell for a long time, allowing clients to enjoy it several times. Believe it or not, this crazy idea actually worked and Daniela Dorrer sold so many Stall Duft cans in Germany and Austria that she decided to open a website, as well. Furthermore, inspired by the success of her canned cow farts, Dorrer intends to soon can and sell other earthly odors like horse, pigs, manure and straw. One can of cow farts costs €5.95 ($8) and is also advertised as the perfect gift for someone who has never been to the country before and wants to know what it smells like. Stall Duft can only be ordered in Germany and Austria, but its owner wants to make it available in other countries, as soon as possible. I knew some people would buy just about anything, but cow barn smell in a can? This is a new low.